eMedley is a cloud-based solution suite that helps Physician Assistant Programs manage their day-to-day activities. It provides comprehensive and centralized tools to automate processes related to accreditation, experience tracking, scheduling, and more. The demand for Physician Assistants is growing rapidly. As a result, the need for successful, accredited Physician Assistant Education programs is also growing very rapidly. As the number of PA students increases, so does the need to implement systems to better track curriculum, testing, documentation, and clinical experience. eMedley caters to the specific needs of Physician Assistant programs. It is the most comprehensive system that tracks student learning and assessment in the classroom through clinical experience and performance in the field including everything a program needs to meet accreditation, program improvement and student tracking requirements. Map course objectives and sessions to ARC-PA Standards, NCCPA Blueprints, Competencies, and Medical Topics to track the what, when, and how of course instruction. Manage question banks, tests, and remediation while administering secure tests and tracking student performance tied to specific PA Competencies. 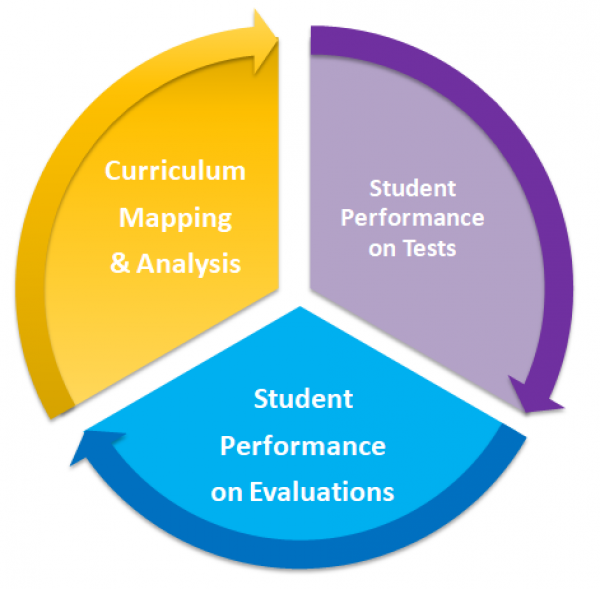 ExamN + eValuate give a complete picture of student performance across multiple performance tools to measure student learning and the effectiveness of the curriculum. There is A LOT of paperwork involved to send students to external clinical sites. 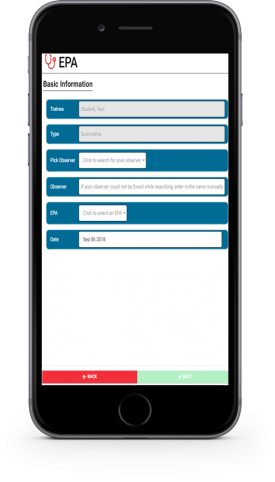 Easily track paperwork, documentation, and contracts for Students, Clinical Sites, and Preceptors. Keep the program up-to-date on anything that is expiring – affiliation agreements, preceptor licenses, student documentation – with automatic reminders. eduSched covers a wide gamut of scheduling options from defining preferences to capacity tracking and automated scheduling, eduSched organizes and manages the entire process. Diagnoses, procedures, ARC-PA Standards, NCCPA Blueprints, Competencies, Medical Topics, and custom program standards preloaded in. Your students deserve the best so why not provide them with the best software available to create an attractive and robust student portfolio with ease. Built-in approval and review processes for assignments, time logs, case logs, evaluations, and documentation. Create both schedule-driven and regular mail merge emails with contact information from all types of contacts (students, faculty, preceptors, site administrators). Generate comprehensive web-based portfolios of students’ experience and competency mastery that students can share after graduation. Our clients are the most important part of our team. They’re the only yardstick that matters for measuring the quality of our products. Map Curriculum: What are we teaching? Which topics and competencies are being covered and how much are we covering? Analyze Performance on Tests: Are students learning what we think they should be learning from our classroom instruction? Administer Performance Based Assessments: How well do students transition from knowledge to application? Analyze Clinical Evaluations: Can students successfully perform in the field based on the concepts learned in the classroom? Curriculum Review: What should we change with our curriculum to improve performance? Ensure that students are ready for professional practice with our EPA (Entrustable Professional Activity) tracking module. Painless evaluations with powerful reporting. 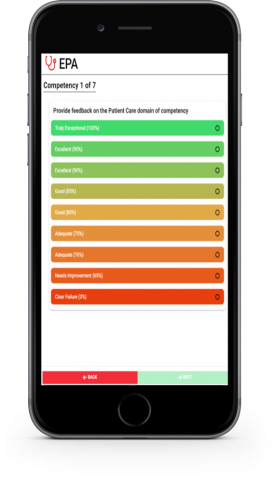 Students get evaluated on the activities right after they perform them using our mobile application without the need for the preceptor to login using a computer, making it easier on the student, preceptor, and you. 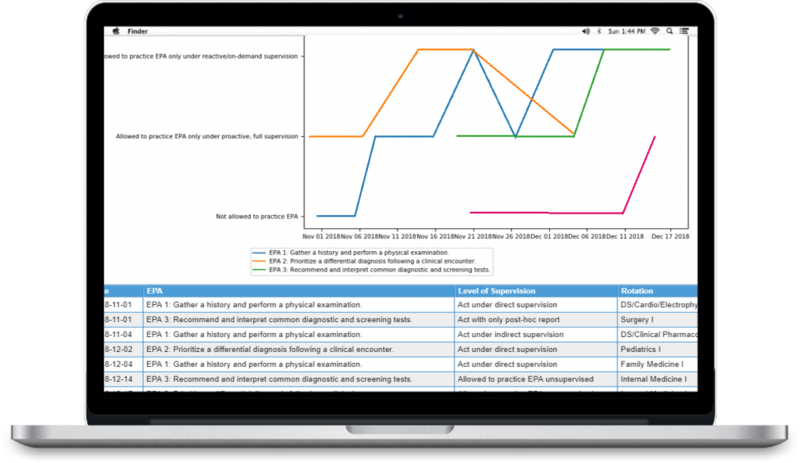 Use our robust reporting to view how a student is performing for each entrustable professional activity with generated graphs based on the latest data and filters for activity, rotation, site, and dates. Analyze overall program performance with using growth curves. Evaluations are filled out using a customized list of entrustable professional activities and competencies that you define and manage. Preceptors are also asked to rate the student’s ability to perform the activity and their trustworthiness.